Black Ferns Sevens Coach Allan Bunting has made his way into the history books by becoming just the second coach in 50 years to win the Supreme Award at the Bay of Plenty Sports Awards. Bunting, who also took home the BayTrust Coach of the Year award at Friday night’s celebration, joins fellow rugby sevens coach Sir Gordon Tietjens on the list of supreme winners. Other household names who have won the top accolade in the last 50 years include cricketer Lance Cairns, kayaker Lisa Carrington and sailor Peter Burling. Sport Bay of Plenty Sport Manager Nick Chambers said Bunting faced some tough competition for the 2018 Supreme Award, including Commonwealth Games medallists Sam and Ben O’Dea, Frances Davies, Michaela Blyde and Scott Curry, but in the end it was his leadership and outstanding achievements over the last 12 months that helped the judges come to a unanimous decision. “Allan has led the Black Ferns Sevens to some exceptional results over the last year, including gold at the Commonwealth Games and gold in the Sevens World Cup,” Chambers said. “He’s a great leader and mentor to the national squad, and has helped the Black Ferns Sevens maintain a commanding position in international competition. Named Women’s Coach of the Year at the World Rugby Sevens awards earlier this year, he’s clearly earnt the respect of his peers and the sports community,” Chambers said. 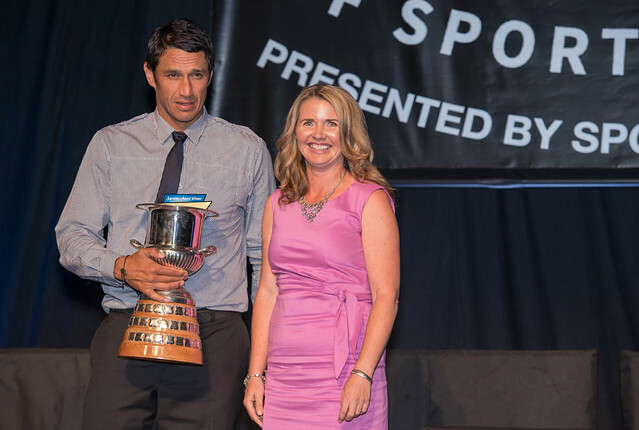 Hosted by Sport Bay of Plenty, the 2018 Bay of Plenty Sports Awards were held at Tauranga’s ASB Arena on Friday, November 16 to recognise and celebrate outstanding achievements by Bay of Plenty athletes, coaches and officials over the past 12 months. The rugby sevens community had a great year, with Michaela Blyde winning the Holland Beckett Law Sportswoman of the Year, and All Blacks Sevens co-captain Scott Curry taking out the Bayleys Real Estate Sportsman of the Year award. Beach volleyball duo Sam and Ben O’Dea were named the University of Waikato Adams Centre for High Performance Team of the Year. In the junior division, Under 19 rugby player Kaleb Trask was named Vodafone Junior Sportsman of the Year for a stellar year of achievements, including being part of New Zealand’s Under 20 World Cup squad, and a member of the Bay of Plenty Under 19 side who won the Jock Hobbs Memorial Tournament. Hockey player and Commonwealth Games gold medallist Frances Davies won the Eves Realty Junior Sportswoman of the Year trophy – an honour previously won by Olympians Luuka Jones and Molly Meech. Local legend Greg Rieger from surf life saving was named Advocate Print Official of the Year, and ten local volunteers were honoured in the YMCA Service to Sport category for having made significant contributions at the regional or national level. This included husband and wife Noel and Jan Jones who have collectively given over 80 years of service to badminton and athletics. The year’s Sports Awards also looked back at 50 years of local sporting achievements. Several past Supreme Winners were in attendance during the evening and were honoured throughout the night, including Wybo Veldman (1971 – rowing), Graeme Crossman (1975 – rugby union), Andrew Stevenson (1982 – rowing), Diane Collings (1987 – shooting), Nicky Cooney (1990 – springboard diving), Renee Fowler (1997 – golf), Dave MacCalman (2000 – paraplegic sport), Sarah Walker (2007 & 2009 – BMX) and Sir Gordon Tietjens (1998 & 2011 – rugby sevens). Sport Bay of Plenty CEO Heidi Lichtwark offered her congratulations to all 2018 finalists and winners: “It’s a real testament to the depth of talent and dedication in our region that the Sports Awards have been running for 50 years.